It may surprise you to learn that geologists were able to determine much of the history of the Earth and its life without knowing anything about the actual ages of the rocks that they studied. Through use of absolute age dating techniques (which were developed during the 20th century; see Section 2), they were able to later assign dates in years before the preset to important events in Earth's history. But, before that, they relied upon a different approach to first determine the sequence of important events in Earth's past: relative age dating. Did rock layer A form before or after rock layer B? Did trilobites live before or after the dinosaurs? Relative age dating has to do with determining the temporal ordering of events in Earth's past. Geologists employ a handful of simple principles in relative age dating; two of the most important of these are are the principles of superposition and cross-cutting relationships. A third key principle--faunal succession--is reviewed in Section 3. 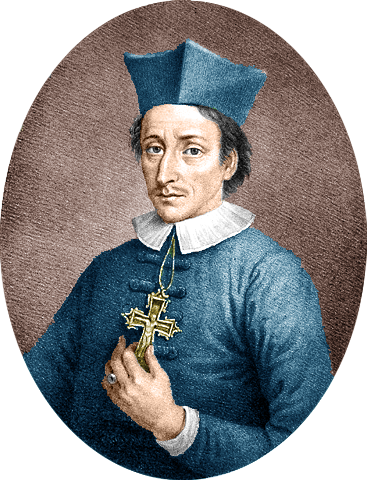 Just as uniformitarianism is the key underlying assumption of geology, the science's most fundamental principle is superposition, developed by Danish anatomist Nicholas Steno (1638-1686) in the 17th century. Portrait of Nicholas Steno (public domain; Wikimedia Commons). The principle of superposition is simple, intuitive, and is the basis for relative age dating. It states that rocks positioned below other rocks are older than the rocks above. 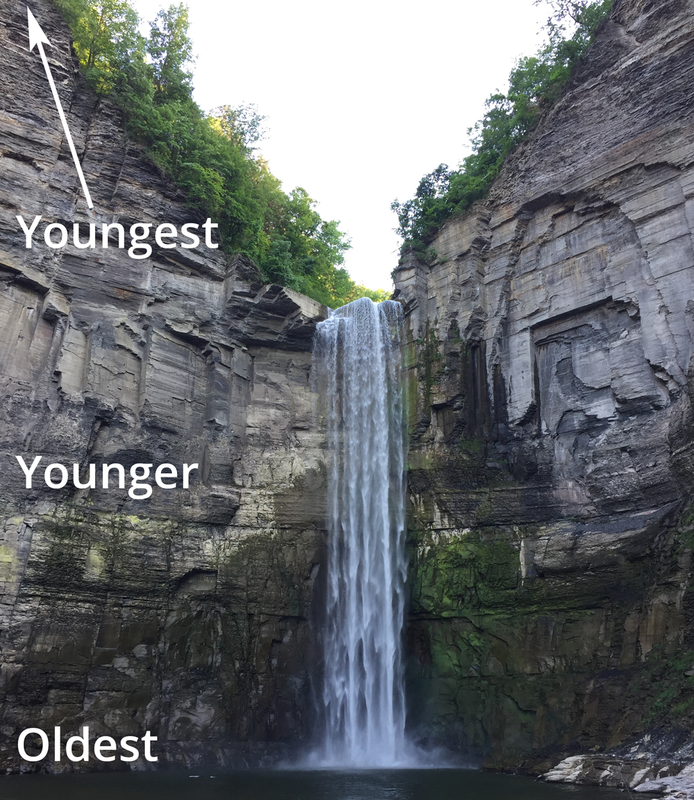 The image below shows a sequence of Devonian-aged (~380 Ma) rocks exposed at the magnificent waterfall at Taughannock Falls State Park in central New York. The rocks near the bottom of the waterfall were deposited first and the rocks above are subsequently younger and younger. Taughannock Falls near Trumansburg, New York, illustrating the Principle of Superposition. Image by Jonathan R. Hendricks. This work is licensed under a Creative Commons Attribution-ShareAlike 4.0 International License. Superposition is observed not only in rocks, but also in our daily lives. Consider the trash in your kitchen garbage can. The trash at the bottom was thrown out earlier than the trash that lies above it; the trash at the bottom is therefore older (and likely smellier!). Or, think about a stack of old magazines or newspapers that might be sitting in your home or garage: most likely, the newspapers at the bottom of the pile have dates on them that are older than the newspapers at the top of the pile. The photograph below was captured at Volcano National Park on the Big Island of Hawaii. 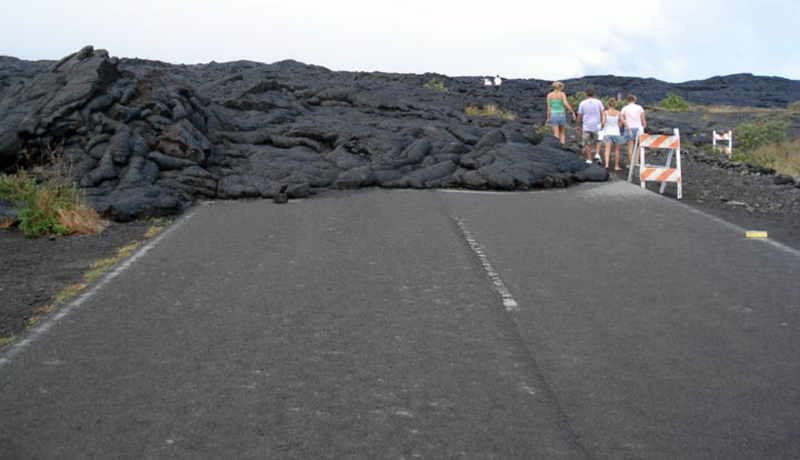 Use superposition to determine which is older: the road or the lava flow? How do you know? A photograph from Volcano National Park, Big Island of Hawaii. Image by Jonathan R. Hendricks. This work is licensed under a Creative Commons Attribution-ShareAlike 4.0 International License. The principle of cross-cutting relationships states that a rock unit (or other geological feature, such as a fault) that is cut by another rock unit (or feature) must be older than the rock unit (or feature) that does the cutting. Imagine cutting a slice of bread from a whole loaf. Because of cross-cutting relationships, the cut that divides the slice from the rest of the loaf is younger than the loaf itself (the loaf had to exist before it could be cut). When investigating rocks in the field, geologists commonly observe features such as igneous intrusions or faults that cut through other rocks. Because these features are the ones doing the cutting, we know that they are younger than the rocks that they cut into. Have a look at the photographs below, which show the curb of a road in a neighborhood in Hollister, California. You can see that the curb is offset: the bottom half does not line up with the top half. As it turns out, the famous San Andreas fault runs below the curb at this location, which has caused the curb to be broken and displaced. 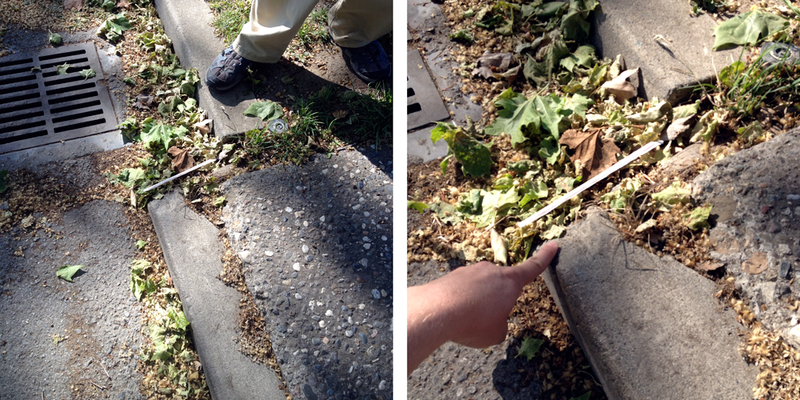 We know that the curb was originally straight when it was first constructed. The fault cut the curb and is thus younger than the curb itself. A curb in Hollister, California that is offset by the San Andreas fault. Image by Jonathan R. Hendricks. This work is licensed under a Creative Commons Attribution-ShareAlike 4.0 International License. The cartoon below shows an imaginary sequence of rocks and geological events labeled A-I. Using the principles of superposition and cross-cutting relationships, can you reconstruct the geological history of this place, at least based upon the information you have available? An imaginary cross-section, showing a series of rock layers and geological events (A-I). A is a fault. B-F are sedimentary rock layers. G and H are both igneous intrusions. Finally, I is an erosional surface. Based on the principles of superposition and cross-cutting relationships, what are the relative ages of these rocks and events? Image by Jonathan R. Hendricks. This work is licensed under a Creative Commons Attribution-ShareAlike 4.0 International License. Let's work through the imaginary example above. First, we know from the principle of superposition that rock layer F is older than E, E is older than D, D is older than C, and C is older than B. Second, we observe that rock layer H (which is an igneous intrusion) cuts into rock layers B-F. It is therefore younger than B-F.
Third, we observe that the fault A cuts across and displaces rock layers B-F. It is therefore younger than B-F. Because the fault does not cut across H, we do not know if it is older or younger than that rock unit. Fourth, we see that G, another igneous intrusion, cuts across A-H; it is therefore younger than all of these (note that G is not displaced by A, the fault). 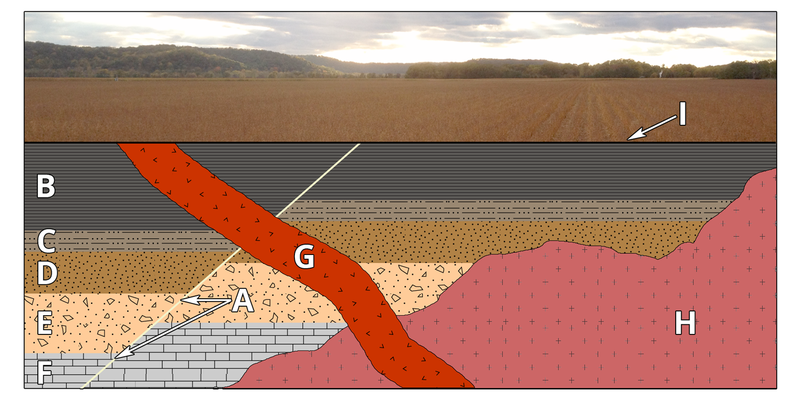 Finally, we note an erosional surface, I, at the top of the sequence (and immediately below the corn field) that cuts both A and G. I is therefore younger than both A and G.
Given the information available, we cannot resolve whether H is older than A (or, vice versa). This problem could be resolved, however, if we were to observe A cutting across H (i.e., the fault displacing the igneous intrusion). What geological principle states that rocks at the bottom of a sequence are older than the rocks above? What dating approach is used to evaluate the ordering of past geological events? Think about the principle of cross-cutting relationships. If a fault cuts across a rock layer, is the fault older or younger than the rock layer? What dating approach is used to determine the age of a geological sample in years before the present date?